This book will piss off a lot of people especially my Conservative friends who think the banks and corporations can do no wrong. This book is written by an insider and puts the lie to the theory that the people who didn't deserve home loans caused the financial disaster and that the banks were the innocent victims. In truth the banks were the sharks in the water and the rest of the American poor and working class were their dinner. After the crash of 1929 safe guards were imposed on the banking and investment industry, Glass-Steagall Act in 1933, to prevent it from happening again but those safe guards were removed in 1999 and the game was on. The result is the financial meltdown that was exacerbated by the Iraq war. Now we have had to bail out the banks in the trillions of dollars but god forbid that we help poor and uninsured Americans by reforming our disastrous health insurance system. There I go again, I digress, the book will open your eyes and may get you pissed off at the banks. Get it, read it, and get involved, demand change and accountability and an end to the corruption at the Fed and the banks and demand transparency and regulation that will stop the banks from stealing America's future. Explains that the current crisis did not happen because ordinary citizens were able to borrow a little more than they could afford, but because Wall Street converted loans into assets that allowed it to borrow much, much more than it could afford. Reveals all the ways corporations inhaling bailout money have gamed the system to get the most money with the least oversight. Exposes the power-bankers that bagged more than $5 billion in compensation before and after their companies siphoned off more than a trillion dollars in federal bailout subsidies. 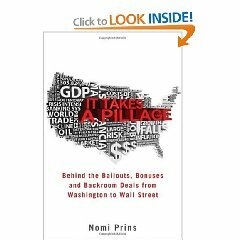 Shows how the most egregious pillagers work at the Fed and Treasury department, detailing how Hank Paulson, Ben Bernanke, and Tim Geithner siphoned off $10.7 trillion from the public’s future for Big Finance’s present. Slams a financial system that will not change, if our government doesn't force it to change, no matter what happens in the so-called free market. Is a former managing director at Goldman Sachs, now a senior fellow at Demos, who writes regularly on corruption in Washington and Wall Street for news outlets ranging from Fortune to Mother Jones. It Takes a Pillage is her third non-fiction book. If you've found yourself enraged and frustrated with how the bank bailout went bust for the American people, or how Wall Street continues to operate as if the rest of the world doesn’t matter, It Takes a Pillage gives voice to your outrage, and provides a deeper understanding of what we really have to be angry about and how we can fight for some real change. 1. The actual bailout has quietly ballooned to $16 trillion dollars (not including over $3 trillion set aside for money market funds), most of it given out with no strings attached. Wall Street firms could continue to tout the myth that ‘talent’ must be paid for – now with stupid sums of bonus money, funded by the American People. 2. The stock market, which has rallied substantially since the government started giving out free money to the banking industry, could tank on the realization that if that money needed to be paid back any time soon, the banks wouldn’t be good for it. 3. Because bigger is better still seems to be Fed policy, JPM Chase could acquire Bank of America – Merrill Lynch, creating one of the largest, federally subsidized banking firms in the world. 4. Because the bigger just can’t help getting badder, JPM Chase could also acquire Citigroup, and we’d be living with a monopoly economy. 5. We could sink into the delusion that the Obama administration has actually done something to restrain Wall Street, lulling us into a false sense of security. Then the remaining big banks will screw us again." 6. Congress could continue to ignore history and never reinstate the Glass-Steagall Act. That act made banks smaller, more specialized, easier to regulate and less expensive to bail out. Repealing it lead to this mess, and there’s barely a whisper heard in Washington of bringing it back. 7. As a Fed approved bank holding company, Goldman Sachs could buy a lot of small banks just to get access to all the money in savings and checking accounts to gamble with. Plus they’d have that great $250,000 FDIC guarantee they get per account. This would make them the biggest bank in the country. 8. Every bank and government agency with access to some aspect of a federal bailout could max out their subsidies chips at once – pushing the full bailout cost to over $26 trillion. 9. Many mid-sized and smaller banks didn’t need a bailout and have been better at allowing consumers access to credit. The largest banks, flush with federal funding and a poor record of helping average Americans, could buy them all up. More interviews with Sarah Palin supporters, because stupid NEVER stops being funny.